JioPhone is different compared to other feature phones already available in the market, claims the company in the Reliance AGM meet last month. Well, it is indeed. The feature phone comes with some “smart” features, which is not often seen on feature phones. But, missed out on a major feature. WhatsApp. 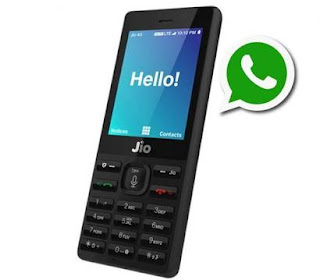 Earlier, reports were such that JioPhone will not come with support for WhatsApp, which possible won’t be a good thing, considering a major segment of the country are dependent on WhatsApp to connect with their loved ones. This news has been disheartening for many. But, with the new report coming in, it’s time to rejoice. A report from Factor Daily reveals that Jio is in talks with WhatsApp to introduce a tailored version of the messaging platform. It is not too long ago that WhatsApp entered India. But the messaging app gained wide popularity in absolutely no time. The messaging application has become extremely popular across India even in small towns and cities. People usually prefer WhatsApping rather than SMS as the preferred means of communication.